Anne's book is available at Amazon.com, Barron's Educational Series, Inc, PetSmart, and many other online and brick-and-mortar stores. (Note: these links open in new pages.) 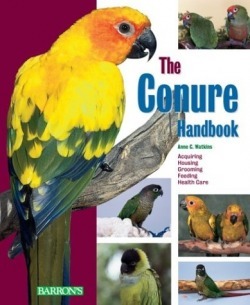 If you've purchased The Conure Handbook and would like a free autographed bookplate, fill out the contact form below and she'll get it right out to you! Want a free autographed bookplate? Send your request via the contact form below. Include your mailing address and how you'd like your bookplate personalized. Your address will not be used for any other purpose. Thank you.